This week we're busy getting stuck into our downstairs bathroom reno. It's actually more a build than a reno, since the room is a shell and has never been completed. That's why things have been a bit on the quiet side around here - I'm attempting to be useful, despite having very little clue what I'm doing. Proper labouring work calls for morning tea (not something I indulge in every day) and slice is a Kiwi classic. 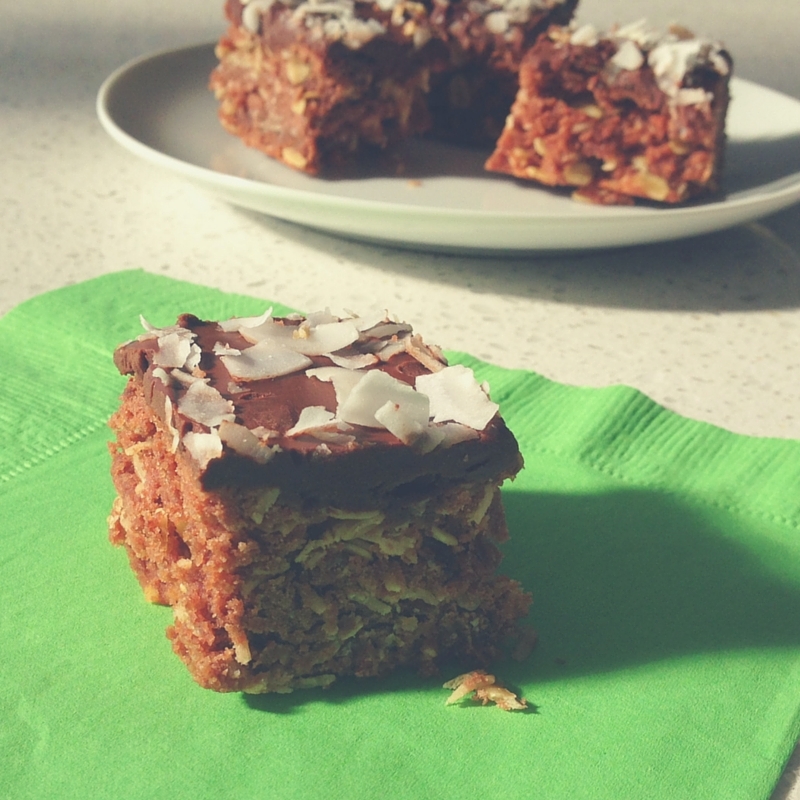 My all-time favourite is chocolate caramel slice, followed by ginger crunch, but both of those are fairly insane in nutritional terms (maximum butter and sugar, minimal anything else), so while nice for a treat, I reckon they're best served to a crowd so they are shared out widely and vanish quickly. This recipe is still definitely treat food, but it's a bit heartier so will keep willing workers going until lunchtime, while clinging onto the indulgent factor to make them happy too. This is a good pantry classic, too - mostly staples that you'll hopefully have on hand. It's a forgiving recipe so if you're short on coconut or oats you can leave either of them out without much ill effect. If you don't have chocolate for the icing you can do a classic cocoa / icing sugar version (1.5 cups icing sugar, 1 Tbsp cocoa, 20g melted butter and enough water to make it spreadable). And it's easy - one dirty saucepan and five minutes prep and you'll have it in the oven. Do you have a go-to recipe to provide fuel when hard labour is required? Preheat oven to 160 C. Line a brownie or slice tin with baking paper. Press into pan and bake for 25 minutes. To ice, gently melt the chocolate and butter, mix to combine and spread over the slice. Sprinkle coconut over the top. Allow to cool slightly before cutting into small pieces. (If you cut it too soon it will crumble heaps - but you can of course make your own crumbly edge vs delicious warm slice trade-offs. Maybe you're okay with crumbly edges!). Yum! When I saw the picture I thought "oh, that is so kiwi!" We just don't really have slices here. I think that should change. Must be a winning recipe as it got polished off in one afternoon - half at a camp meeting over afternoon tea, then the rest was devoured at Sunday tea. (the pieces got smaller so there was more to go around ;-) ) Very yum.